*1 Limitations apply. For terms and conditions, visit www.tektronix.com/lifetimewarranty. The TDS2000C Digital Storage Oscilloscope Series provides you with affordable performance in a compact design. Packed with standard features – including USB connectivity, 16 automated measurements, limit testing, data logging, and context-sensitive help – the TDS2000C Series oscilloscopes help you get more done, in less time. Advanced triggers – rising/falling edge, pulse width, and video – help you quickly isolate your signals of interest. Once you’ve captured a signal, advanced math capabilities and automated measurements can speed your analysis. 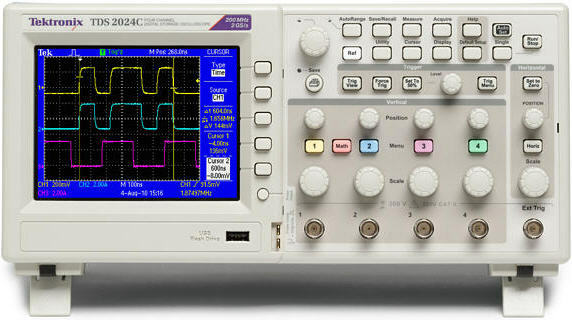 Quickly perform an FFT or add, subtract, or multiply waveforms. Sixteen automated measurements quickly and reliably calculate important signal characteristics such as frequency or rise time, while the built-in Limit Test function enables you to easily identify problems in your signal. The built-in Help menu provides you with important information on your oscilloscope’s features and functions. Help is provided in the same languages as the user interface. Easily capture, save, and analyze measurement results with included National Instrument's LabVIEW SignalExpress, Limited Tektronix Edition software. Every TDS2000C Series oscilloscope ships with an included copy of the Limited Tektronix Edition of National Instrument’s LabVIEW SignalExpress for basic instrument control, data logging, and analysis. SignalExpress supports the range of Tektronix bench instruments*2 enabling you to connect your entire test bench. You can then access the feature-rich tools packed into each instrument from one intuitive software interface. This allows you to automate complex measurements requiring multiple instruments, log data for an extended period of time, time-correlate data from multiple instruments, and easily capture and analyze your results, all from your PC. Only Tektronix offers a connected test bench of intelligent instruments to simplify and speed debug of your complex design. In addition to industry-leading service and support, every TDS2000C Series oscilloscope comes backed with a Lifetime Warranty*1 as standard. *2 For a complete listing of Tektronix instruments supported by NI LabVIEW Signal Express, visit www.tektronix.com/signalexpress. *3 Bandwidth is 20 MHz at 2 mV/div, all models.